With only 77 non-conference games remaining on the schedule for the remainder of the season (and 46 of those will take place this weekend), we've reached the Second Season: conference basketball. At this point, it's become clear what each team will need to do to earn a Tournament bid, and what they'll need to earn their seeding once they make the field. Every team has a magic number of wins they'll need to make the field as an 11 seed. 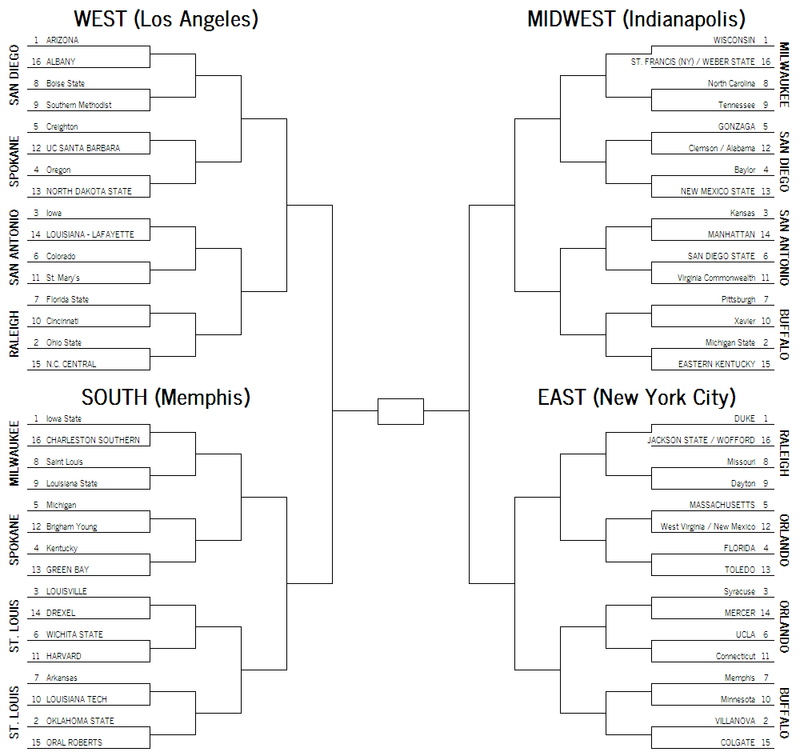 For most teams, every win above that threshold will be worth about 1½ seed lines. Most major conference teams--even most bubble teams--could still conceivably wind up with a #1 seed if they swept through their conference slate, but we're starting to see the ceiling on mid-major seeds. Harvard, for instance, tops out at a 7- or 8-seed, even if they don't lose another game. This week there are still 26 locks or near-locks. 46 teams meet the broad definition of the bubble (having between 10% and 90% chance of reaching the field), up from 45 a week ago. The number of long-shot teams has fallen from 14 to 11. 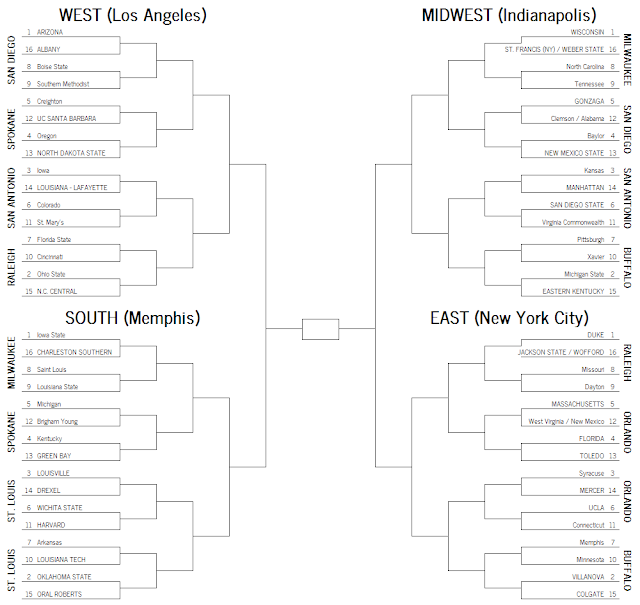 The first five teams left out of this week's bracket are Georgetown, Virginia, Oklahoma, Butler, and California. I've already mentioned the importance of avoiding losses to the league's bottom half, as well as UConn's potentially precarious position. The Huskies dropped their first AmCon game at Houston this week and made me look good on both fronts (this happens rarely, so I like to point it out when it does). The Huskies maintained a spot in the bracket thanks to worse losses or losses to worse teams by other bubble squads, but they can't afford another slip. Dayton's outlook improved this week after they beat Murray State and Winthrop by a combined 55 points this week, which improved their win projection for the remainder of the season by nearly a full win. In a week where seemingly every other bubble team was taking a bad loss, that was enough not just to move the Flyers back into the bracket, but to put them in with a single digit seed. Clemson is, I think, a bit of a paper tiger, if you'll forgive the expression. They've got an average margin of nearly 16½ points per game, but their best victory came at home against South Carolina. Their strength of schedule ranks among the 50 easiest in the nation, and six of their nine victories have come against teams in the bottom 100 of the TAPE ratings. What to make of West Virginia? The Mountaineers have lost all 5 games they've played against teams in the TAPE top 150, but the largest margin of defeat in any of those games was just 9 points. The Mountaineers need to get to 11 wins to feel totally safe, but even if they just go 9-9 in conference play they probably have a good case for a trip to Dayton. The current projection has teams 3 through 9 beating up on each other in conference play, and those seven teams all winning between 6 and 10 Big East games. Chances are, though, that over the course of a short season one or two teams will win more than their share of close games and come out looking like better teams than they actually are. After their win at Northwestern last night, Wisconsin's chances of going undefeated in the regular season rose over 1% for the first time. Those numbers are high. Neither of those teams will earn an at-large bid without sweeping the conference. Harvard is a pretty good team, and would be competitive in any league. It's unfortunate that the Crimson didn't challenge themselves in the non-conference season. Their only game against a top-50 team was a loss at Colorado, and a trip to UConn next week is their only other opportunity to notch a quality win. Wichita State has about a 1-in-31 chance of finishing the regular season unbeaten. If they do, they'll almost certainly be given a 1-seed in the NCAA Tournament, even though the Magic Number rule of thumb explained earlier would have them top out at a 2-seed. If the Shockers take the 3 losses they're expected to, though, they'll be a really dangerous 6- or 7-seed. After successfully gaming the RPI for the last several years, the Mountain West is suffering at the hands of that flawed metric this season. Among the league's contenders, only New Mexico projects to have a better RPI than TAPE rating, with San Diego State, Utah State, and UNLV all looking to finish between 10 and 30 spots worse in RPI than TAPE. California's win at Stanford last night bumped the Cardinal out of today's field, but it wasn't quite enough to project the Golden Bears into the field. While the top four in the Pac-12 compare favorably with the Big Ten and Big 12, the bottom of the league and the rough travel schedule present a minefield for the five teams in the middle of the pack who are trying to find enough separation to earn themselves a bid. Like the Pac-12, there's a minefield at the bottom half of the league table (those trips to Nashville, Athens, Auburn, College Station, and Starkville will be fraught for the SEC's bubble), but the top of the league provides nearly as much opportunity for victories that will catch the Committee's attention without nearly as much strength as the western league. The forecast calls for lots of SEC teams in the Dance, but very few advancing past the first weekend. BYU has lost five of its last six games. St. Mary's has lost four of its last five. The numbers say that both still project into the field, but common sense says otherwise.